These images are part of an ongoing Chandra program that monitors a region around the Milky Way's supermassive black hole, Sagittarius A* (Sgr A*). 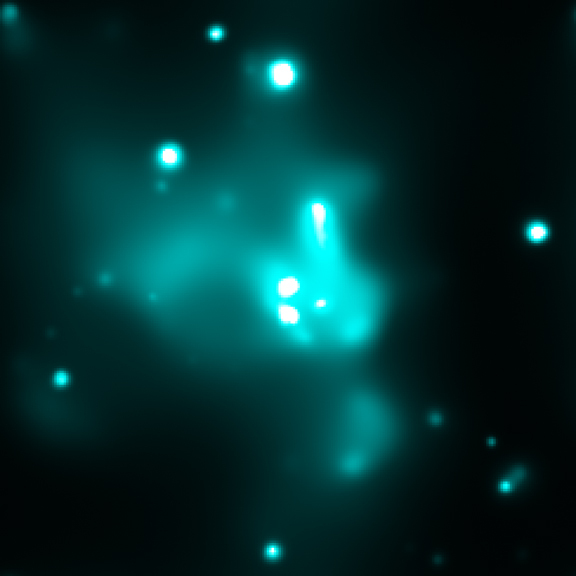 Four bright, variable X-ray sources (circles) were discovered within 3 light years of Sgr A* (the bright source just above Source C). The lower panel illustrates the strong variability of one of these sources. This variability, which is present in all the sources, is indicative of an X-ray binary system where a black hole or neutron star is pulling matter from a nearby companion star. The high concentration of X-ray binaries in this small region was a surprise - other observations of a larger region around Sgr A* had suggested that there was only a 20 percent chance that even one X-ray binary would be found within 3 light years of Sgr A*. 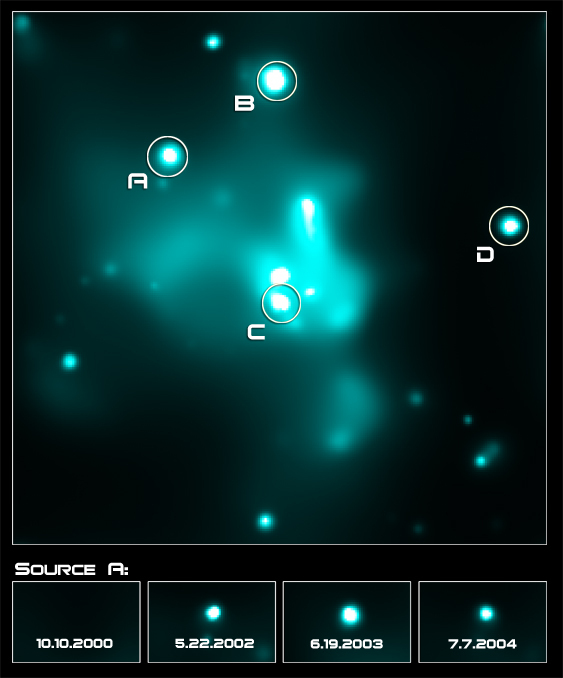 The observed high concentration of X-ray binaries is strong circumstantial evidence that a dense swarm of 10,000 or more stellar-mass black holes and neutron stars has formed around Sgr A*. The swarm likely formed as stellar-mass black holes gradually decelerated in their orbits and sank toward the center of the Galaxy. Black holes orbiting the center of the Galaxy at a distance of several light years will pull on surrounding stars, which pull back on the black holes. The net effect of this gravitational action and reaction is to decelerate the black holes, which have masses of about 10 Suns, and speed up the lower-mass surrounding stars. The black holes spiral inward, and the low-mass stars move out. From the estimated number of stars and black holes in the Galactic Center region, this process, called stellar dynamical friction, could produce a dense swarm of 10,000 or more black holes within 3 light years of Sgr A*. A similar effect could be at work for neutron stars, but to a lesser extent because they have a lower mass. Once black holes are concentrated near Sgr A*, their intense gravity can induce an ordinary star in a binary system to "change partners" and pair up with the black hole while ejecting its companion. This process and a similar one for neutron stars can account for the observed binary X-ray sources. Coordinates (J2000) RA 17h 45m 40.00s | Dec -29° 00' 28.00"